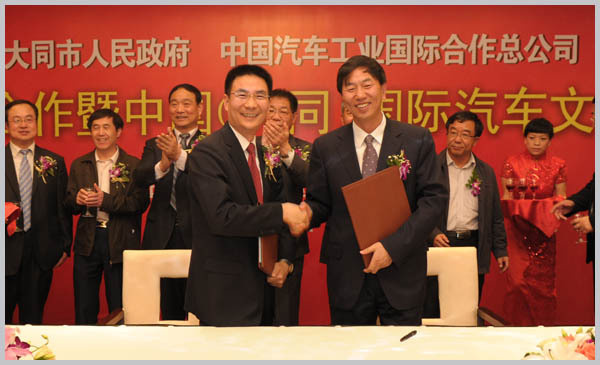 April 15, CNAICO andDatong Governmentsigned a strategic cooperationagreement and the"China(Datong) International AutomobileCulture Festival"(referred to as "Automobile culture festival") project cooperationframework agreement in YungangJianguo Hotel. The president of CNAICO Ji Xuecheng andGeng Yanbo, Datong mayor representing the two sidessigned a cooperation agreementand delivered a speech. According to the strategiccooperation agreement,CNAICO andDatonggovernment willestablish long-termstrategic partnershipin order to strengthen the ties andeconomicinteraction ofthe local economyand thecentral rate,give full play toadvantages ofDatongpolicy, environmental advantages, geographical advantages, combined with the machinery, automobileindustry advantages , business operational advantages, exhibition professional advantages owned by the AutomobileInternational, promote bilateralcomprehensive development.As afirst joint project under the strategiccooperation agreement, theAutomobileInternational andDatonggovernmentalsosigned the "China(Datong) International AutomobileCulture Festival"project cooperationframework agreement.The agreementagreedin August this yearthey intend tojointly holdinDatongcar culturefestival. Ji Xuecheng, the president ofCNAICOoutlinedin his speechin the steamof internationalbusinessdevelopment.He gave highappreciation and recognitionto Datonggovernment’sthe long-term visionand ambitionto "vigorously develop the cultural and creative industries,cultural industriesand actively explorenew development model”.The two sideswill jointly organizecar culturefestivaland that will combine thefashionableAutomobile Exhibitionculture andlong history and culture ofDatong, which is arather innovativeattempt,this is bound tohave a positiveand far-reachingimpacttoDatongcultural and creative industriesandthe AutomobileIndustry Exhibition ofCNAICO. Geng Yanbo, mayor of Datong inhis speechpointed out thatlong-term strategiccooperative relations of CNAICO andDatongis important events, becauseit will change development direction OFa city. Meanwhile,Geng YanbomayorsaidDatongfuturedevelopment planswill containconstructiveConvention Center. Before the signing ceremony, Ji Xuechengpresidentvisited selectedlocations of theAuto Culture Festival-Datongsouth wall off the city, and had friendly talked with Geng YanboMayor. DatongMunicipal Committee, PublicityMinisterMa Bin, government Secretary-GeneralDuanJianhua, Deputy Secretary-GeneralZhang Xinping, Zhang Haifeng, Municipal Tourism BureauZhangDian-sheng, DatongDaily MediaGroup chairmanand party secretaryHu Huaishengattended ceremony of thetwoagreementssigned. The members of theautomobile international attendedthe signingceremony wereJing Yongjianvice president, PengMingJing, deputy secretary，JiaYu，general managerof Business Administrator department,Jia Huaijiang, general manager ofIndustrialInvestment department, general managerof UIACORen Weiand general manager of Integrated Management DepartmentTang Liang.